China’s winter production cuts to curb smog have sent commodity prices higher. 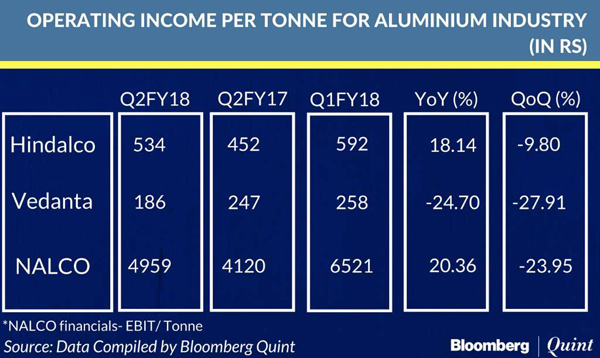 That’s no solace for aluminium producers in India as fuel and raw material costs are rising faster than the prices of the base metal. Yet, Hindalco Ltd. is best placed among its peers to beat the winter chill, brokerage Axis Capital said. It’s insulated from the rising costs of alumina given that its plants are fully integrated and can source bauxite requirement internally, the brokerage said. The Aditya Birla Group company has also secured almost its entire coal requirement through captive mines and linkages, it said. Alumina prices rose 50 percent in the last one year compared to a 22 percent gain in aluminium on the London Metal Exchange, a Macquarie report said. China’s decision to shut illegal smelters on environment concerns doubled prices of inputs like caustic soda, coal tar pitch and calcined petcoke that contribute about 15 percent of the production costs, it said. For three months ended September, Vedanta’s operating income per tonne declined over the previous quarter and the year-ago period. Higher coal and alumina costs offset the strong performance of its zinc business, Axis Capital said. Nalco’s impressive alumina volumes were offset by lower-than-expected realisation and higher costs. Hindalco’s ebitda per tonne too fell 10 percent, but the decline was lower than its peers. Aluminium producers also stare at losses due to a coal shortage at captive power plants that threatens to shut down smelters. State-run National Aluminium Company Ltd. was the first one to shut three captive power units due to the fuel crunch. The Association of Aluminium Producers later wrote to the government seeking immediate supplies. While the quantum of output cuts in China is yet to be assessed, the impact will be felt, Macquaire said. China is operating at 95 percent of its 38 million tonnes per annum capacity. Any cuts will create an unavoidable deficit, according to the brokerage. Kotak Securities, however, said lower-than-expected output cuts by Chinese smelters will ease the supply till March. It suggests that aluminium market fundamentals are set to improve, led by tighter supply outside China and a lower output growth in China. The brokerage reduced the aluminium price targets by 4 percent to $2,225 a tonne for the years ending March 2019 and 2020. Of three large aluminium producers in India, Vedanta has the highest ‘Buy’ recommendations along with the highest return potential of 24 percent, according to a Bloomberg consensus poll. Hindalco follows with 89 percent ‘Buy’ calls and a return potential of 19 percent. Nalco has the least ‘Buy’ recommendations of nearly 46 percent.